If you grow a mustache, chances are that you want to keep your ‘stache neat and tidy and out of your mouth. Finding the best mustache scissors possible will help you keep that mustache well groomed whether at home or traveling. So, here is a look at some of the best mustache scissors available today. 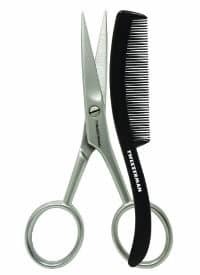 Reasonably priced and just the right size for getting close to the lip and trimming that mustache evenly and quickly, the Tweezerman Stainless Steel Mustache Scissors can be the perfect solution to that ever growing mustache and those stray beard hairs. These scissors are about 4” long from the tip to the handle, feature long finger hoops and are capable of cutting the entire length of the blade. You even get free lifetime sharpening should these scissors go dull. Users give these Tweezerman scissors very good ratings and review that they are well made and robust, trimming their mustache and stray beard hairs easily and safely. They also feel they are good for both home use and for traveling. 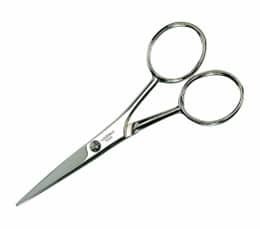 However, a tip for maintaining the scissors in good condition for a long period is never to leave the scissors damp. After using them, you must wipe dry them fully. Some users do use this tool to cut their nose hair, too. However, I would say that they are quite sharp and you should take extra care cutting your nose hair with it. The Sanguine Professional Mustache Scissors are a pair of 5 inch long scissors designed specifically for trimming facial hair. These black scissors are handcrafted from Japanese steel and have a convenient barber’s grip to help you control each snip of the scissors. They will cut mustache, beard and brow hairs efficiently and effectively. Moreover, they will last you for years. 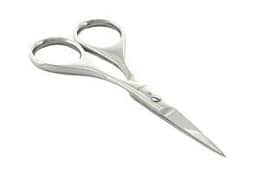 Reviews for the Sanguine scissors are excellent with users stating that they are extremely well made and they provide them with a precise cut. They also report that they are very sharp and have an excellent finish. People love the fact that you can adjust the tension. 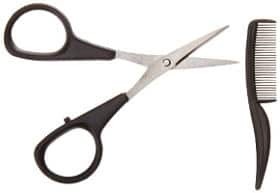 I did come across comments from couple of users stating that the blade on the scissors is a little thick but the majority did not have that problem and expressed great satisfaction from the use of these scissors. The company also offers an exchange or money back guarantee if you are not happy with the product. The Tweezerman G.E.A.R. Moustache scissors with comb is a nice set for keeping your mustache neatly trimmed. The scissors have a straight blade with micro serration to keep the hair you are trimming from slipping out of the blade. They are made from stainless steel and the comb is handy for keeping your mustache tidy looking. This set comes with a protective case. It is very sharp and can be used to clip eyebrows and stray beard hairs as well as your mustache. This tool retains its sharpness for a long time. It also has large finger holes making it convenient for people with big hands. The comb is a nice addition to the scissors. User reviews are very positive. People are very happy with the scissors but not very impressed with the quality of the comb. Overall, this is a good product and the name Tweezerman is well know for its quality and service. The Allary Mustache scissors are stainless steel and about 4 inches long. The comb is gently curved to make combing the mustache before trimming simple and easy. These scissors are a good size for traveling and can be used by people who are either right or left handed. The blades are rust resistant, however, you should wipe them dry before storing them. Reviews for this product are quite good with users finding that these scissors can cut their mustache hair without pulling and they are made to last for years. Some people did mention that they are too small for their fingers and were not happy about the cutting performance saying that they do not cut as close as they would like. Overall, the product gets mixed reviews which include users being very happy with the product and some others not so satisfied. Suvorna Ador Mustache and Beard Scissors are made from high quality carbon stainless steel. These scissors are 5” long and the blade is about 1.25” long and comes with a synthetic leather pouch. The finger holes are a good size which is also confirmed from the comments of people with large hands and you can conveniently use this product for trimming mustaches as well as the beards. They do cut very smoothly without any pulling and are a good weight. Reviews are very good with users finding these scissors to be well made and extremely sharp. Few people felt that they didn´t cut so well but this was more of an exception rather than the rule. The Sally Hansen Mustache Scissors are about 4.5 inches long with 1 ½ “ blade. The blade is straight and is good for trimming mustaches, beards and brows. The accompanying comb is about 3” long. Reviews and ratings are quite positive. Users report that these scissors are reasonably sharp and they work well for both their right and left hand. They cut precisely and have a feel of quality when you hold them in the hand. The little comb does good job keeping the beard and mustache tidy. It is also important to point out that if you have larger hands, you may find these scissors a little small. In conclusion, although having a pair of mustache scissors may seem like a small thing, choosing the best mustache scissors will surely help you have a well groomed mustache easier and simpler.